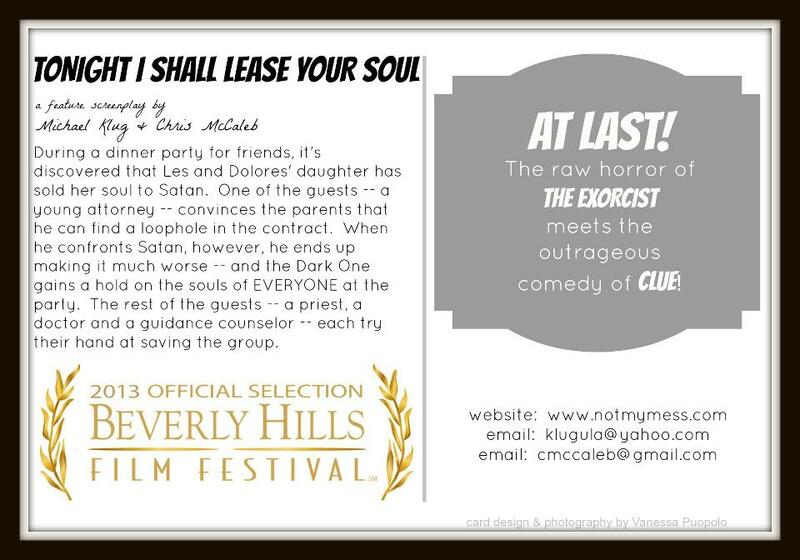 INFO: Tonight I Shall Lease Your Soul is a feature spec script. LOGLINE: During a dinner party for friends, it's discovered that Les' and Dolores' daughter Kimmy has sold her soul to Satan. One of the guests -- a young attorney -- convinces the distraught parents that he can find a loophole in the contract. When he confronts Satan, however, he ends up making it much worse -- and the Dark One gains a hold on the souls of EVERYONE at the party. The rest of the guests -- a priest, a doctor and a guidance counselor -- each try their hand at saving the group. PROTECTION: This piece has been protected with the WGA; West. COLLABORATION: Chris McCaleb of Hand/Eye Coordinations co-wrote the script. DRAFT (s): Six (6) drafts have been completed. PAGE COUNT (including title page): One hundred nineteen (119). READING (s): In 2011, a first reading was held, with actors Libby Baker, Nathan Baker, Karyn Brownlee, Michael Brownlee, Michael Klug, Casey Hayes, David Kurtz, Justin Marchert, Chris McCaleb, Hamish McCollester and Maggie McCollester. PITCH: The raw horror of The Exorcist meets the outrageous comedy of Clue. 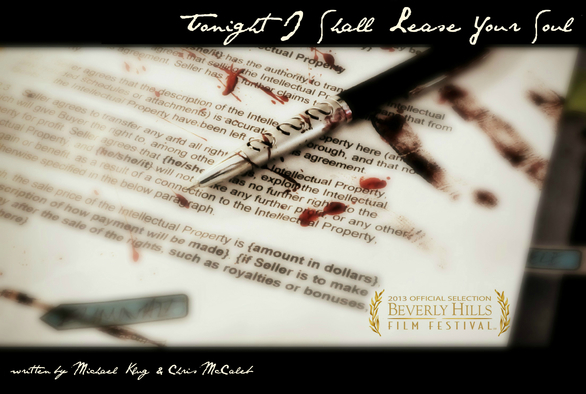 ACCOLADES: Beverly Hills Film Festival Official Selection 2013 / Shriekfest Quarter-Finalist 2013. CIRCULATION: Tonight I Shall Lease Your Soul is currently out to several producers. ADT'L INFO: Welcome to a Lutz family dinner party. Great food. Good conversation. Plentiful drinks. Secrets. A missing daughter. A contract. And THE BEAST. photography and postcard design by Vanessa Puopolo. © 2009-2019 michael klug. all rights reserved.